Don’t look. Desperate Mary Grace Winters knew the only way to save herself and her child from her abusive husband was to stage their deaths. Now all that remains of her former life is at the bottom of a lake. Don’t trust. As Caroline Stewart, Mary Grace has almost forgotten the nightmare she left behind nine years ago. Slowly she has learned to believe that hew new life, and new identity, is here to stay. Don’t tell. Then her husband uncovers her hidden trail. Step by step, he’s closing in on her and everyone she loves. Now Caroline must decide whether to flee again or whether the time has come to stay and fight. 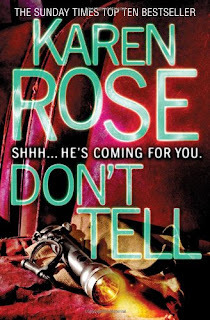 Don’t Tell is the first of a fantastic romantic suspense series by Karen Rose. I absolutely love when a book can literally keep me on the edge of my seat through the entire reading, and Karen Rose has yet to let me down. Not only that, but she is one of the best of the best when it comes to characterization. If you tried to tell me that Caroline and her son Tom were only book characters, I would probably argue on reflex before remembering that they are actually fictional. I honestly do think of them as real people because Rose so expertly details their lives, thoughts and history. The first time I read Don’t Tell, I remember thinking over and over that Tom Winters had to be the most well-written villain I had ever come across. Not necessarily the most cunning or the most evil, but the most fleshed out? Definitely. Rose gets inside his head in a way that is truly chilling. You don’t just know his thoughts. She makes you feel them. He all but steps right out of the book. It is uncomfortable, spine-tingling, creepy…it makes for delicious reading. Thinking about him actually makes me shiver and want to look over my shoulder…not to mention leaving lights on after dark! I have also never rooted for a character as much as I did for Caroline. Watching her growth and progression over the course of the book actually made me a little emotional – more than once. Seeing her start to believe in herself, stand up for herself and feel worthy of love was very empowering. I think psychiatrists should hand this book out to women that have suffered abuse as a testimony to overcoming the pain, fear and self-doubt that such relationships leave behind. I really can’t express how much Don’t Tell by Karen Rose means to me, or how much I love and recommend it. I have read the first ten books of the series and loved them all, but this one will always stand out. The eleventh of the series, Silent Scream, was just released and I can’t wait to get my hands on it!